The SNIPS process (Self-assembly plus Non-solvent-Induced Phase Separation) is a newly developed method to create asymmetric membranes with well-defined pore sizes in the top separation layer, for instance for ultrafiltration of proteins or viruses. In the SNIPS method a block copolymer film is coated onto a substrate, left to evaporate for a magic time period, and then plunged into water. Graduate students Yibei Gu and Rachel Dorin of the Wiesner group at the Cornell Department of Materials Science and Engineering set out to investigate what happens during the evaporation period in the top surface separation layer. They used an in-situ doctor blade coater developed by CHESS staff scientist Detlef Smilgies to study the membrane formation in real time at CHESS D1 station. Their results were recently published in Macromolecules . Figure 1: in-situ doctor blading set-up at CHESS D1 station for in-situ measurements of membrane top surface separation layer formation. The membrane was formed by a triblock terpolymer consisting of isoprene, styrene, and 4-vinylpyridene blocks (PI-block-PS-block-P4VP; ISV). The ISV membrane solution was cast at high speed (3-20 mm/s) onto a silicon substrate. Under these conditions casting can be considered a two-step process: at first a liquid film is deposited and then the film self-assembles during the solvent evaporation process. Using grazing-incidence small-angle x ray scattering (GISAXS), the researchers found that the film forms a peculiar square lattice at its surface within the first minute which degrades upon further drying. The plunging step into the non-solvent water opens up a porous structure and seems to fix the regular pore structure at the membrane surface, while the asymmetric porous substructure of the membrane remains relatively disordered [2,3]. The in-situ measurements showed that the best-ordered structure formed after about 50 sec, revealing four distinct scattering peaks associated with the formation of a square lattice. Afterwards the top separation layer becomes increasingly disordered, as signified by a single broad scattering peak after 100 sec of drying. Figure 2: Time series of horizontal cuts of the detector image. The square lattice reaches its best order around 50 sec after casting. At longer times the structure starts to degrade. In-situ GISAXS can help to find the optimum time window when to plunge the sample into water. 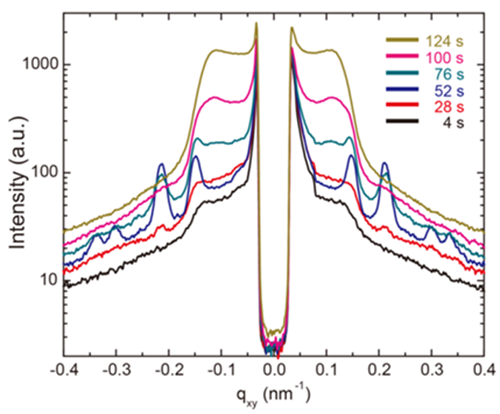 The researchers encountered a surprise when studying an ISV terpolymer of low molar mass. In this case two ordered structures developed over time, before the film disordered again. Fig 3a shows that initially a body-centered cubic structure formed with the close-packed (110) plane parallel to the film surface. After about 30 s this structure faded and transformed into a simple cubic structure with the (001) face parallel to the film surface (Figure 3b). Both structures could be clearly indexed. Figure 3: Order-order phase transformation in low molar mass ISV terpolymer. Initially the polymer assumes a BCC(110) structure which transforms to a simple cubic (001) structure, and then disorders. The associated theoretical spot positions are indicated as circles. The work resolved a structural puzzle that existed before: Observation of a BCC lattice is consistent with earlier small angle x ray scattering (SAXS) results on quiescent ISV terpolymer solutions at higher concentrations (typically above 14 wt%), while a simple cubic structure is consistent with earlier scanning electron microscopy images of the top surface separation layer. The new results suggest that BCC to SC order-order transitions may be responsible for these results. The exact origin of this transition is still unclear and warrants further investigations. William A. Phillip, Rachel Mika Dorin, Jörg Werner, Eric M. V. Hoek, Ulrich Wiesner, and Menachem Elimelech: "Tuning Structure and Properties of Graded Triblock Terpolymer-Based Mesoporous and Hybrid Films", Nano Lett. 2011, 11, 2892–2900.